The DALEY backpack is designed for the commuter who needs to transport gear but wants a minimal frame. 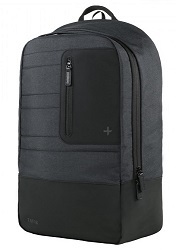 It features a fully lined laptop compartment, made for a 15" device, with additional internal pockets for tablet and accessory storage. The padded straps, back and handle are made from a breathable mesh to offer comfort and utility. Finished with an external quick-access stash pocket for phone, keys or wallet, the DALEY tech bag fuses style with function. BONUS! Includes a FREE! ($19.99 Value) Mobile Edge UrgentPower 2600mAh Universal SmartPhone/USB Device Battery Charger. The UrgentPower is a universal smartphone battery for backup power when you need it most. A USB charging cable, Apple 30-pin connector, Micro USB & Mini USB connectors are included, making it compatible with most smart phones, e-Readers, Tablets/iPads and iPods.